Traditional kitchen design offers many options for inventiveness and expressing your individuality. From relaxed farmhouse kitchen designs sporting rustic furniture and chintzy prints to formal and elegant kithens with floor-to-ceiling painted cabinets, and from the refreshing simplicity of Shaker kitchens to the colourful mixing and matching of vintage-style kitchens, traditional kitchen design really has something to offer to everyone. We have gathered lots of stunning traditional kitchen design ideas and clever tips to help you design the classic kitchen of your dreams. For more practical know-how, find out how to design a kitchen for a period property and check out our guide to designing a traditional family kitchen. If you're after a smart traditional kitchen design, start by honouring the proportions of the room and creating a symmetrical layout, with your oven or range cooker as the centre. 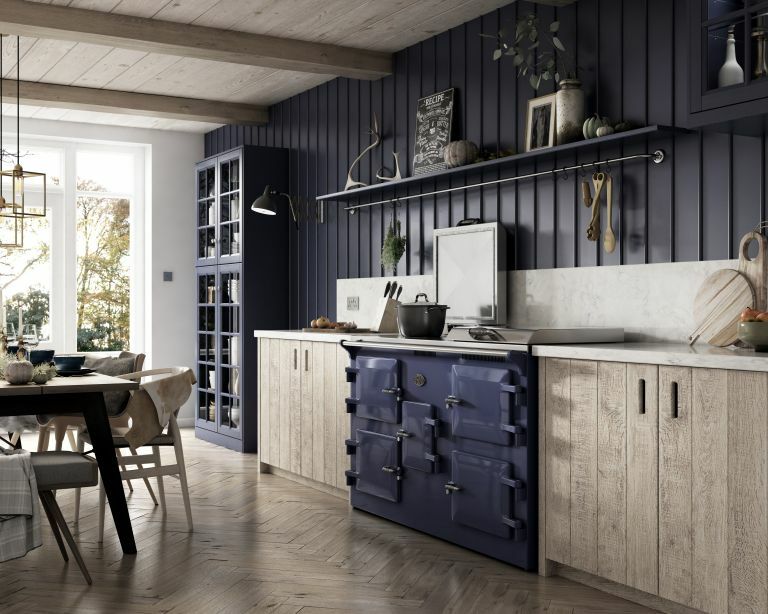 This traditional kitchen features a cast iron range cooker in Victoria Blue by Everhot and is given a smart, symmetrical design that is accentuated by the carefully positioned lighting. If your kitchen layout is long and narrow, add dimension to the design by opting for a high-contrast colour scheme. This traditional kitchen design has been given a striking update with dark navy paint which contrasts beautifully with the light wood of the flooring and cupboards. For more colour scheming inspiration, check out our kitchen paint ideas. Traditional kitchen design ideas are all about creating harmony; from cabinets to flooring materials to the shape and materials of the furniture, nothing should 'stick out' too much. This beam-ceilinged cottage kitchen is complemented by the heavy wooden furniture, which creates a balance between the top and bottom of the room. Need more tips? Find out how to choose dining furniture. Looking for traditional kitchen design ideas for a room with tiny windows? Consider choosing a colour that will amplify the natural light that does get in. This doesn't automatically mean painting your kitchen white – a vibrant yellow or orange shade applied around the window will add warmth as well as maximising light. Take care not to overwhelm a small kitchen window with a heavy window treatment – instead, pick a light, fabric blind like the one used here, by Vanessa Arbuthnott. Browse more tips on adding natural light to a room. Beautifully hand-painted kitchen cabinets instantly elevate the design of any kitchen, but they are especially important in a traditional kitchen. If your budget is flexible, invest in floor-to-ceiling cabinets for maximum design impact (and excellent storage space). We have plenty more kitchen cabinet design ideas to inspire you. If you are blessed with a large open plan kitchen, then you have the perfect space for creating a kitchen diner. Ideally, the dining area should be positioned away from the cooking area. In this traditional kitchen, the beams create natural zones within the space, but you can also use any kitchen windows for zoning. We have more versatile kitchen diner ideas for you to browse. Floor tiles are by far the most practical choice for kitchen flooring – and they can add design interest, too. Choose a bold pattern to add character to an otherwise neutral traditional kitchen. For similar chessboard pattern tiles, try Topps Tiles. Need more advice? Find out how to choose the best kitchen tiles. Kitchen islands can help you make the best use of your traditional kitchen, giving you more room for food preparation, socialising, and even having breakfast. The key to choosing the right kitchen island for a traditional kitchen is opting for a painted design with a rounded shape. Need more inspiration? We have lots of clever kitchen island design ideas. Looking for traditional kitchen design ideas that give you a cosy, lived-in look? Wallpaper can work wonders on the space, adding charm and personality. Keep the rest of the design neutral to avoid an over-decorated look. The kitchen has been decorated with the Flora wallpaper from Sandberg. Browse our gorgeous gallery of kitchen wallpaper ideas that will add character to your kitchen. Tablecloths are something of a disappearing element in kitchen design nowadays, but they're actually a brilliant way to instantly add a rustic charm to a traditional kitchen. If you are planning on using a tablecloth, pick a round kitchen table, as the fabric will drape better. Browse through our pick of the best traditional dining tables to pick yours. There's nothing quite like a range cooker. Reliable and good-looking, they are almost synonymous with a traditional rustic kitchen design. Pick yours in a bright colour to let it (deservedly) take centre stage in your kitchen. If you have any period features in your kitchen, especially wooden beams, try to match the tone of any unpainted furniture for a cohesive look. The same applies if you are adding period-style replica beams. We like the bright look the light wood colour creates in this traditional kitchen design. Whether you are incorporating fitted kitchen storage or freestanding units, a traditional kitchen design is the space to include storage furniture that is both functional and decorative. Think an impressive wooden larder and an imposing painted dresser. To choose the best storage for your kitchen, check out our kitchen storage ideas and find out how to design a freestanding kitchen. Want to introduce a bit of countryside charm into your kitchen? Elegant open shelves are a great way to create a lived-in, slightly busier look than a wall-to-wall cabinet design will permit. Find out more about designing a country style kitchen in our guide. We think that nothing quite completes a traditional kitchen design scheme like wood flooring, especially if the kitchen opens onto a dining area or utility room. It is true that real stone flooring, or ceramic or porcelain tiles are more practical – but there is a warmth and elegance that is only achievable with wood. Do choose engineered wood flooring, however, rather than solid – it will better cope with the changes in temperature and humidity. Find out more about choosing the right kitchen flooring in our guide. Want to add real oomph to a smaller kitchen? Our answer is: bold, all-over colour. A great paint colour will really bring out the quality of your cabinets – and bring to life other details, such as lighting and handles. The Peckham Rye kitchen by deVol makes a truly stunning case for going bold with colour. We love the way the same colour and finish has been applied to the walls and the cabinets, making the decorative elements of the kitchen stand out. Ready to experiment with colour? We have 12 colourful kitchen ideas for you to check out. Pastel shades are universally flattering for kitchens, and they are a great middle ground between white and bolder colours. Painting your traditional kitchen cabinets in a pastel shade allows you to personalise your kitchen while keeping the design understated. Find out how to paint kitchen cabinets in our guide. Ready to try out something truly different? Try a dark and moody colour scheme in your kitchen. The pros of a dark kitchen are: 1) it'll be much more low-maintenance than a light kitchen; 2) if you have a beautiful window in your kitchen, the dark colours will accentuate it. You will need to be careful with how you plan your kitchen lighting – the right lighting scheme will make a dark kitchen look stunning in the evenings. Ready to embrace the darkness? We have lots more dark and atmospheric decorating ideas. Psst, we'll tell you a secret: almost every traditional kitchen design can handle a bit of chintz or boho mix-and-match. Think clashing prints, bright colours (that you may not want elsewhere in the house, but that look oddly wonderful in the kitchen), knick knacks and wall art. Or just throw on a colourful tablecloth for a touch of boho chic. Browse more brilliantly boho design ideas. If you live in a more modern property, but are yearning for a more traditional look, one option may be to add a structural feature that will 'age' your kitchen. This stunning London kitchen designed by Humphrey Munson features a bespoke canopy that's been built especially to conceal the extractor – and accentuate the beautiful six-oven black range cooker. Want kitchen walls that look stunning and are easy to clean? Tiles are your best bet; they are the most hygienic option for a kitchen, and they offer almost endless design possibilities, instantly adding colour and texture to your walls. Use our guide to choose the best kitchen tiles for your new room. Ready to focus on a specific traditional kitchen style?